This package contains an Asset Bundle for Yii 2.0 Framework which registers the CSS files for the AdminLTE user-interface. The CSS files are installed via Yii's recommended usage of the fxp/composer-asset-plugin v1.1.1 or later. AdminLTE dropped web-font inclusion in 2.4.0, so you need to include your desired font manually, ie. Inclusion via CDN is not recommended for production, please adjust this to your project's asset-bundling workflow. When upgrading please see the AdminLTE upgrade guide for adjustments you need to make in your views. For issues with DmitryBaranovskiy/eve.git, please see #128 and #113. For other issues, please search GitHub first. This asset bundle provides sample files for layout and view (see folder examples/), they are not meant to be customized directly in the vendor/ folder. Copy files from vendor/dmstr/yii2-adminlte-asset/example-views/yiisoft/yii2-app (or other theme) to @app/views. As this asset depends on our AdminLteAsset it's the only asset you have to register, for example in your main.php layout file. By default the extension uses blue skin for AdminLTE. You can change it in config file. And then just replace class of body skin-blue. You can use AdminLteHelper::skinClass() if you don't want to alter every view file when you change skin color. Note: Use AdminLteHelper::skinClass() only if you override the skin through configuration. Otherwise you will not get the correct css class of body. Namespacing rules follow the Yii 2.0 framework structure, eg. dmstr\web for the Asset Bundle. 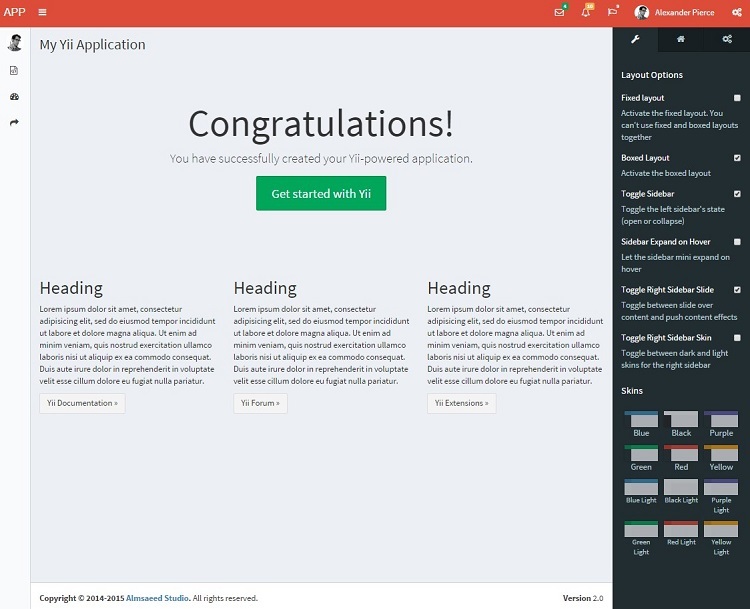 update html markup to AdminLTE v2.0 for advanced template. added fork repository url for "yii2-fontawesome"
bumpup rmrevin/yii2-fontawesome from 2.7. to 2.8.
different structure of adminLTE with "minimum-stability" : "dev"